I held out my hand to Jasper. He looked at it, hesitated, and took it. He squeezed it. "It's all going to be OK," he reassured me. I looked at his battle-scarred jaw. It always broke my heart to look at his scars. We were lined up with, wolves, and Esme was a few yards away with Carlisle, Rose and Emmett. The newborns were coming. I saw a vision right then. The newborns were coming. "Jasper," I choked out, my voice strained with a small sense of fear that I wouldn't admit was there. Jasper could feel it. He understood my signal by reading my emotions. Jasper calmed me, although I was already calm enough. After a few dragging seconds, they appeared. They were so fast, but none of us were intimidated. My fear had been replaced with excitement and exhilaration. "It's time," Jasper murmured. "Go!" he yelled. The wolves howled, and all of us sped forward. Jasper let go of my hand as he swiped out at a newborn. A man was about to pin me to the ground and crush me in his arms. I darted out of the way in plenty of time and flicked my leg up to his face. He was knocked backwards, but as he recovered I got a grip on his head. Jasper shoved me out of the way and finished him off for me. I growled. "I can fight for myself!" I shrieked, the rush of the fight turning my voice even more high pitched. I turned just as another newborn launched herself at me. My visions did me proud and I dodged lightly out of the way. One thing I hadn't foreseen was how another newborn got me in his grip. I screamed, struggling in the tightening grasp. Jasper pulled me free and once again killed him for me. I lunged into another attack, emitting shrill yells of fear, rage and excitement. I ripped the head from the huge newborn's shoulders. The body collapsed to the ground, and I ripped the rest of him apart. As I fought another newborn, I watched Sam Uley attack, swiping his long claws, tearing the newborn's rock hard skin. A wolf I recognised as Quil pounced onto the newborn I was attacking. I cried out in frustration. "I'm not incapable!" I screeched at him, assisting the wolf to tear the vampire apart. Jasper scooped me up, as if he was trying to get me away from the battle. I was screaming, struggling in Jasper's arms. "Let me go!" I yelled, leaping out of his arms. I pushed Jasper away. "Stop being so overprotective! I'm fine!" I screamed at my true love. I sped away to a vampire who was about to enclose Embry in his grip. "No you donâ€™t!" I called fiercely and leapt onto the vampire's back. He was bucking, trying to make me slip from his back. I scratched his face, making him cry out in pain. With the help of Embry, I tore the newbornâ€™s head away, and the wolf ripped the body to shreds with his claws. We looked at each other. Embry dipped his head, and I nodded, running my hand down his thick-furred back the. My hand reeked of dog, but I was so absorbed in the fight I didn't care. Rosalie was struggling under a small male vampire's grip, pinning her down. With a high pitched screech that made all the wolves wince and could burst a human's ear, I dragged the newborn from my sister fiercely. "Thanks, Alice." Rosalie called. Jasper cried out. I shot around;he had been bitten, adding to the bites he had suffered years ago. 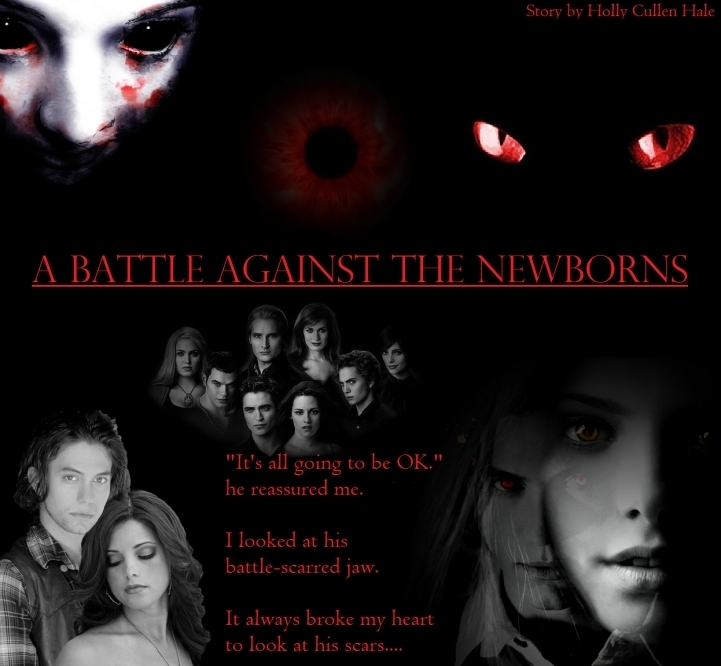 I closed my eyes, and was suddenly pushed over onto the hard ground, pinned down by a newborn. I was shrieking, desperate to get free as I could feel my body being crushed under the intense strength. No one seemed to be coming to help. I closed my eyes tightly. "I love you, Jazz." I whispered, stifling sobs. A blissful feeling of the huge weight being lifted off me made me sigh in relief. Jasper threw the newborn aside and stood me up. He laid his hand on my face as I hugged him tightly. Jasper took my hand, and I flitted lightly around the nearest newborn. As the newborn tried to catch me, Jasper caught him by surprise and I helped him rip him apart. A howl alerted us that Jacob had come to help us fight. He insanely attacked, not concentrating on what he was doing or how the vampire was defending. "Jacob, no!" Jasper yelled as the vampire got the red wolf into his grip. I hid my face in Jasper's chest as bloodcurdling cracks rang out around the clearing. I heard the paw steps of the of Jacobâ€™s pack mates, then they all howled. When I looked, I saw Jacob lying motionless on the ground, letting out pained whines of agony. Carlisle knelt at his side. Would Jacob survive? I couldn't bear to imagine the grief in Bella's eyes. I looked into the future, or at least tried, briefly forgetting that werewolves were an annoying blind spot for me. I didn't see Bella grieving at the least. I knew how much she loved him, and I accepted it, as I knew she would never leave Edward. I started running to the newborn who was celebrating his efforts. Jasper caught me. "Let me go!" I screamed. Jasper put me down but held onto me. Leah, Paul and Embry all leapt upon the vampire. "If I'd have let you attack, you could have gotten killed with the newborn!" he hissed. Jasper held onto me. The battle was over. All the newborns were killed, except one. Rosalie approached, snarling. "No!" the small girl wailed. "Please. I'm begging. I don't want to fight. I surrender." Rosalie looked at Carlisle, who nodded. She backed away, over to Emmett. Jasper tucked me under his arm. "I told you it would all be all right." He smiled. I lifted his arm and gently stroked his new bite. The battle was over, and we reigned victoriously.